during qualifying for the Monster Energy NASCAR Cup Series 1000Bulbs.com 500 at Talladega Superspeedway on October 13, 2018 in Talladega, Alabama. 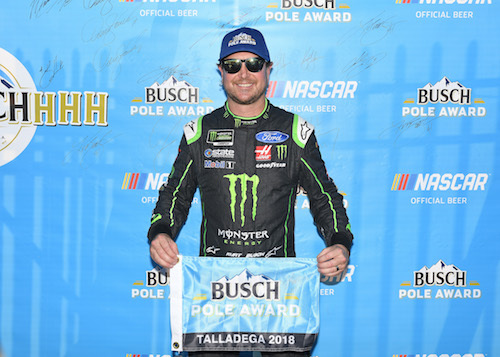 Kyle Busch claimed his fifth Monster Energy pole of 2018 on Saturday at Talladega (Ala.) Superspeedway when he posted a 48.906-second/195.804 mph lap in the second of two rounds of single-car qualifying for Sunday’s 1000Bulbs.com 500. Although Busch is a NASCAR veteran with 27-career poles, Saturday’s pole is the first of his career at a restrictor-plate track. Stewart-Haas Racing swept the front two rows of the starting grid, with Clint Bowyer joining his teammate on the front row and a couple more teammates, Kevin Harvick and Almirola in row two. Lining up being the SHR quartet on Sunday will be another group of four teammates from Hendrick Motorsports, with Chase Elliott, Jimmie Johnson, Alex Bowman and William Byron qualifying fifth through eighth, respectively. The top-eight spots on the starting grid nearly mirrored the top-eight on the first-round speed chart. The four Stewart-Haas drivers were followed by the four Hendrick drivers, the only difference being a swap in positions between Bowman and Johnson. Busch led the first round with a 49.051-second/195.225 mph lap. Teammates are a theme throughout the starting grid. Team Penske, which has dominated racing at Talladega in recent years, saw its three drivers — Brad Keselowski, Ryan Blaney and Joey Logano — qualified 18th through 20th.